As you may have heard, Google has given each attendee of its fast approaching Google IO conference (happening May 19-20th) a choice of a free Droid or a Nexus One (us included). The conference, as Taylor points out, could very well be the perfect time to launch Froyo. Whether that is the case or not, we will be there, blogging any important news live the second they occur. While all of these features are good, there are a few features that should be mandatory such as Apps2SD becoming native to the Android OS. Android 2.2 seems to focus on mostly performance enhancements with little addition of actual features, at least from what the rumors gathered so far. 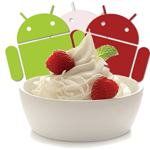 There is no official release date for Froyo yet, although you can be sure that vanilla Android devices such as the Droid and Nexus One will be faster to receive updates than custom UI phones that have Sense or MOTOBLUR piled on top of them. It is also unknown whether older gen devices would be able to receive this update but I think there is a good chance they would not. Of course, that will not stop custom ROMs from unleashing some Froyo action to these older devices, just like they had already done with the 2.1 for the G1. So what features are you hoping to see in Android 2.2?